Where the right hand end of a workpiece is in the chuck and the workpiece extends into the spindle or even outside it on the left of the headstock there are two main problems. Firstly, if the workpiece of small diameter compared to its length, then there is a tendency for it to whip around especially at higher speeds. Secondly, even if it is fairly rigid, it can bend under its own weight. If the workpiece is being drilled and this happens the diameter of the bore will get larger as the bore gets deeper. One solution to this is the spindle steady. This is a hollow tube that fits onto the end of the spindle. The whole tube is bored to the same bore as the spindle. But one end is then bored so that it is a good fit on the spindle. 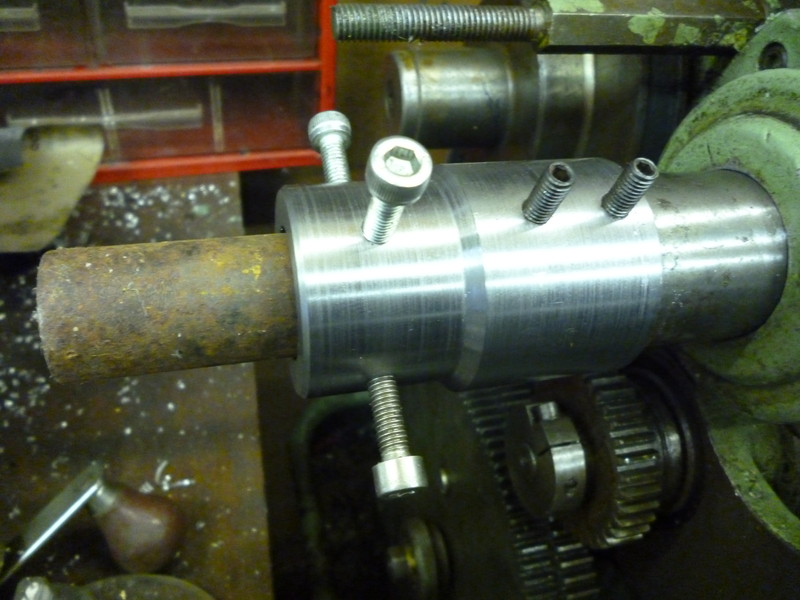 There are a couple of grub screws to hold it on the spindle. In the other end there are four cap screws that can be used to hold the workpiece. If the workpiece is simply being held to stop it waving about, it can be centered by sight. If the workpiece is to be machine for a long distance through it then is can be centered my making a tube that just slides along it and just fits inside the steady.